Some Day We Will Spin My Darling!!! Isn't it purdy????? I know he was cheap, not as high class as the ones I have lusted over....but he's mine and I LUV him!!!!! WHAT??? What do you mean "what yarn"??? O.K, so we haven't exactly gotten to "first base" yet!!! 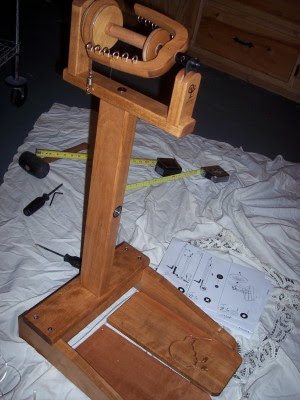 BUT.....we are working on it.....seems as though I am a bit nervous...having issues getting the "tension" just right. I have spun some....Stuff.....just not sure that it qualifies as yarn......as in ANY kind of yarn....or Hey.....maybe I just invented a NEW kind of yarn!!!! LOL!!! I have a book, I do NOT like to read instructions (I don't even like to read those informative little tutorials found oh so conveniently on the computer.........ask my mother....I have a problem I call her)!!! I have had such good offers of advice from Jessi and Elizabeth so I'll put their advice to good use and I know I will get it .......just like anything else in life....practice makes perfect!! SO......until further notice....and until the "tension" clears just gaze upon the empty bobbin and dream along with me of beautiful yarn!!!!! I was at the LYS to pick up some yarn and noticed a cute girl (gathering a nice stash of fibery goodness and knitting related goodies if I do say so myself)! For some reason she looked familiar to me. I just "knew" that I knew her from somewhere....and I just had to ask if we had met. Come to find out I don't know her at all but I have seen her blog in the past!!! (Her blog was one that I found and then lost when I had a computer crash)! Is her button not the cutest you have seen? Head over to Alabama Fiber Dreams and be sure to check out her Etsy shop.....this girl not only knits...but she spins, dyes, sells yarn, stitch makers galore.....oh and she is a stay at home Mom.......Can we say superwoman here???? (Oh...I'm not worthy)! I hope to meet up with Jessi at some point in the future and hopefully have some time to knit and or spin together!! It's always a treat to find another Alabama Blogger!! FINALLY some news on the KIWI!! DH and I finally had time last night to work on the wheel......pretty much have it all together except for the wheel and the mechanism that attaches to the treadles. Hope to finish the project Friday night!!! YIPPEE!!!!!!! I don't advocate Bella on the kitchen countertops.....and she doesn't show any interest at all thank goodness other than a couple of times she has jumped in the window behind the sink. 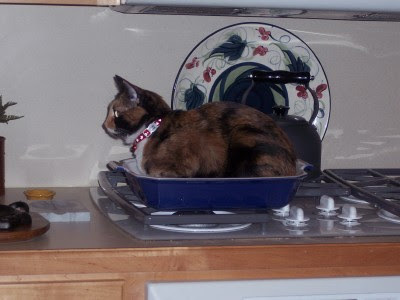 BUT....I was putting dishes away the other night, turned around and there was Bella, just as pretty as you please all snuggled in the casserole dish!!!! She is incredibly cold natured and likes to lie in front of the oven when I am cooking....I guess she was hoping to get warmed up a bit!!! LOL!! Socks and Rag Tag Update!!! UPDATE: Pkg. was mailed to Colorado on Monday morning....Rapid Rag Relayers are SOOOOOO going to win first place!!! I am about half way finished with the mate to this little fella. I am SOOO ready for Fall and the colors of this Lorna's Laces yarn are so pretty....although my camera doesn't show the colors to their best advantage!! 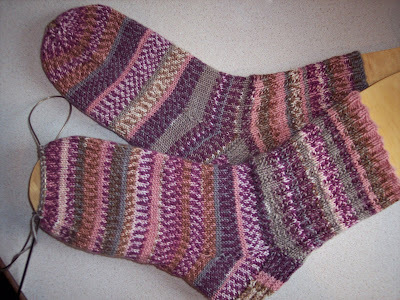 My very first pattern sock!!! The above sock is about as "patterned" as I have achieved to this point. 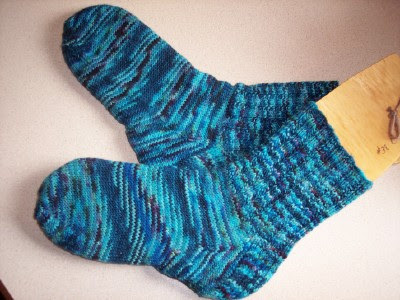 It is especially exciting because this pattern was written for the Ruby Sapphire sock club by Emily!! Emily is the very first knitting blog I found and she has got to be the nicest person there is!!! So talented not only in knitting but in so many other areas!! I can't WAIT to get started and hope I can do the pattern and the gorgeous yarn justice!!! This sock yarn has tencel in it which I have never worked with....but it sure is SOFT....like Buttah!!!!!!! Rag Tag UPDATE....AND....Bloggers Are The Best!! 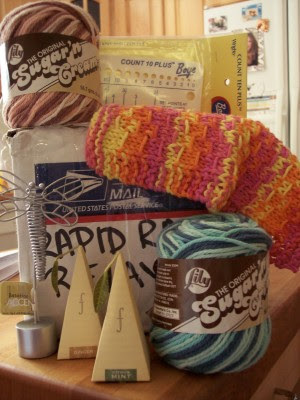 I DID receive the Rag Tag Box Today.....YIPPEE!!! More about that below. BUT First: I had the wonderful pleasure of getting to meet one of my blog buddies and her friend at an Alpaca breeder meeting held in Birmingham!! It was a short visit but how awesome it was for me to finally meet Elizabeth with the added bonus of meeting her friend Ginny!! Just an instant connection to them both.....like running into an old friend......talking a mile a minute trying to play "catch up" on everything!!! LOL!!! Both ladies went to the SAFF last year and gave me so much good information and answered a lot of questions I had....not to mention sharing lots of good info on using a drop spindle and spinning wheel!! (Oh....I am SOOOO going to the basement after I finish this and get that last coat of polyurethane on my wheel)!!! I seem to have acquired a "spinning fever" this morning!!! LOL!!! We plan to meet up again in the near future and hope to have more time before we all go to SAFF....which I'm not sure what I am most excited about.....the SAFF itself or spending time with friends!!!! I ALSO got to meet Karen with the Birmingham Spinning Guild....what can I say.....just another wonderful woman that I felt an instant comfort level with!! I am DEFINITELY going to be seeing her again and hopefully soon at one of the Guild Meetings!!! 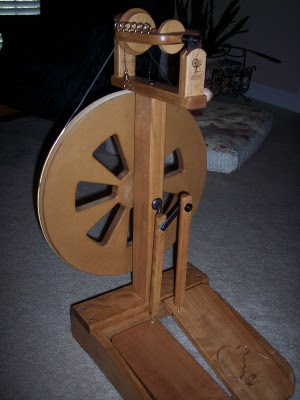 Karen gave me a lot of good information on spinning wheels....of which she states I will have several rather than just one!! LOL!! I could NOT believe my eyes when I opened the box....Helen....I guess great minds must think alike because this is the VERY same pattern I had planned to use!!! LOL!!!! Love the color choices!! It is still in the 100+ degree days here and the pink/brown yarn reminds me of Neopolitan ice-cream that my grandmother would have in her freezer....and the blue is like the ocean!!! Hmmm...since today is Saturday and I have until Monday to get the pkg. mailed I will have to think about which I want to use and which one I want to add to my stash!! A BIG thanks to Helen for such a GREAT package!!! I N.E.E.D.E.D. the needle/ruler!!! I would like to direct you to the sidebar where my "mood" is displayed. BECAUSE MY RAG TAG RELAY BOX WASN'T DELIVERED TODAY!!!!!! Waaa! Waaa! Waaa! I WANT my Rag Tag Relay Box!!!!!! Hmmmm.....surely the delay isn't due to bad Karma....from me "ragging" others that my team is going to win and they are going to LOSE????? What can I say??? I just love good competition!!! O.K. Thinking only good, happy thoughts now!!!!! I've checked and checked and just like a little kid on Christmas Eve the anticipation has mounted to a frenzy!!! 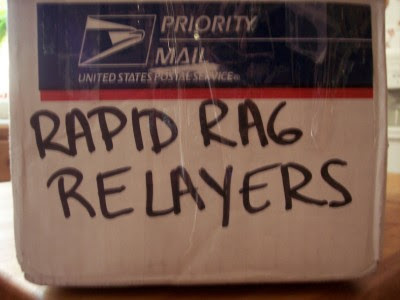 THEN............I was tagged to receive the coveted Rapid Rag Relayer's team member box......but.......NO BOX!!!! UGH!!!! I am dying to check that little box that says I have received the box....but NO BOX!!! I hope you aren't lost!!! Have you seen the prizes Emily as up for the winners???? I SOOO want to win....or at least place....is it possible to win first, second AND third prize???? They are all such GREAT prizes!! Big thanks go out to Emily for putting together such a fun way to pass the hot days of August!!! When it is 104 to 105 degrees there just isn't much to get excited about.....but the Dish Rag Tag has been fun....checking out all the teams to see how everyone is progressing, taunting my friends (who are all assigned to different teams)......as to who will win! There have been several "nana nana boo boo's" floating around.......such fun for adults to be reduced to child like behavior!!!! LOL!!!!!! A Bit of Knitting Going On!!!! 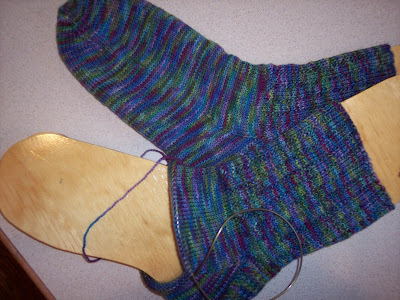 First up: Garter Rib Stitch socks, size 1 needles, Yarn: Life Style . Hmmm...notice anything different about one??? I RAN OUT OF YARN!!!! I measured and measured and still come out with the same length for each sock!! 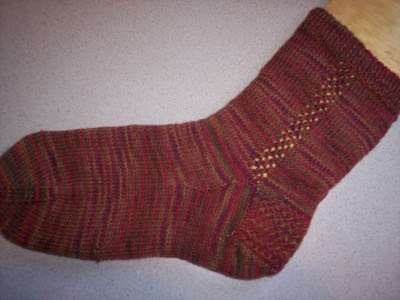 When I finished the first sock I had a T.A.D. of yarn left over but not on the second sock!!! I called the owner of the LYS (Knit N Stitch in Trussville, AL, if you are ever in this part of the state).....to see if she had any left over yarn as she had knit a pair of socks for the shop, but she had exactly enough for the socks that she knit. She did offer to knit a pair of child size socks and give me the left over yarn, which was incredibly nice!! I call these my Pirates of the Caribbean....the blues remind me of the caribbean....with just a touch of black for the pirates!! LOL!! This is the yarn that was gifted to me by Jane at Quiddity . 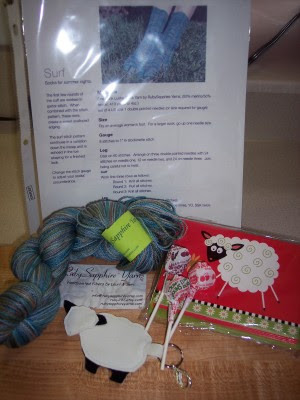 Love Jane's blog and I LOVE this yarn!!! Jitterbug by Collinette...this was my first time to knit with this yarn and it is running a close second to STR yarn in the way it feels while knitting with it. 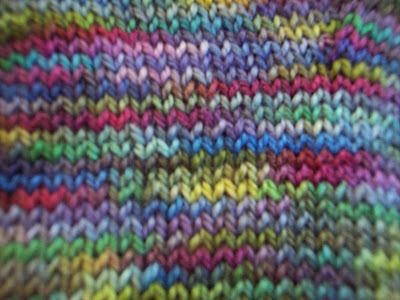 Sophie's Toes Yarn: Colorway Iris Garden....this is THE most beautiful mixture of colors...reminds me of a Monet painting!!! You can find Sophie's Toe's on Etsy. I can't say ENOUGH about how sweet Emily is!! She always ships the next day after listing yarn! If you have time go through her archives for past colors. 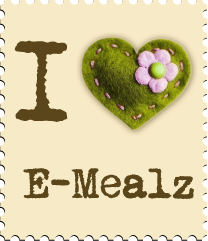 Be sure to sign up for email notification of when yarn is listed. I absolutely LOVE the fact that this yarn knits the SAME....NO pooling!!!!!!! Is this not the most beautiful colors?????? RAG TAG UPDATE: Despite my hopes of receiving a pkg. on Saturday it just wasn't to be!! Last seen, the Rapid Rag Relayers box is in Indiana with Camilla. From AL to MN to IN and HOPEFULLY on it's way to ME!!! LOL!!! Check back for updates!! Late Addition: The box is now in Kentucky!!!!! Dish Rag Tag Race is ON!!!!!!!!! The Dish Rag Tag started yesterday!! My group is the Rapid Rag Relayers and our Team Captain, Carrie, is starting things off!!! !